Often estate planning focuses on the “big picture” issues, such as who gets what, whether a living trust should be created to avoid probate and tax planning to minimize gift and estate taxes. However, there are many smaller issues, which are just as critical to the success of your overall estate plan. Below are some of the issues that are often overlooked by clients and sometimes their attorneys. Is there sufficient cash? Estates incur operating expenses throughout the administration phase. The estate often has to pay state or federal estate taxes, filing fees, living expenses for a surviving spouse or other dependents, cover regular expenses to maintain assets held in the estate, and various legal expenses associated with settling the estate. How will taxes be paid? Although the estate may be small enough to avoid federal estate taxes, there are other taxes which must be paid. Depending on jurisdiction, the state may impose an estate tax. If the estate is earning income, it must pay income taxes until the estate is fully settled. Income taxes are paid from the liquid assets held in the estate, however estate taxes could be paid by either the estate or from each beneficiary’s inheritance if the underlying assets are liquid. What, exactly, is held in the estate? 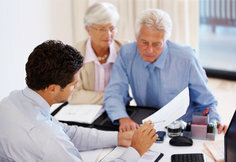 The owner of the estate certainly knows this information, but estate administrators, successor trustees and executors may not have certain information readily available. A notebook or list documenting what major items are owned by the estate should be left for the estate administrator. It should also include locations and identifying information, including serial numbers and account numbers. Your estate can’t be settled until all creditors have been paid. As with your assets, be sure to leave your estate administrator a document listing all creditors and account numbers. Be sure to also include information regarding where your records are kept, in the event there are disputes regarding the amount the creditor claims is owed. Some assets are not subject to the terms of a will. Instead, they are transferred directly to a beneficiary according to the instruction made on a beneficiary designation form. Bank accounts, life insurance policies, annuities, retirement plans, IRAs and most motor vehicles departments allow you to designate a beneficiary to inherit the asset upon your death. By doing so, the asset is not included in the probate estate and simply passes to your designated beneficiary by operation of law. Your probate-avoidance living trust will not keep your estate out of the probate court unless you formally transfer your assets into the trust. Only assets which are legally owned by the trust are subject to its terms. Title to your real property, vehicles, investments and other financial accounts should be transferred into the name of your living trust.